Everyone wants certainty on funding for the NDIS. The announcement last week that both sides of politics were scrapping plans to raise the Medicare Levy to fund the NDIS created great anxiety in our Every Australian Counts community. People with disability and their families want certainty about the future of the NDIS. They want to know it is funded not just this budget, but in all the budgets to come. Turns out the rest of the country agrees. Every Australian Counts has commissioned a poll from Essential Research to find out what ordinary Australians think about the NDIS and how it should be funded. 89% of respondents agree that people with disability deserve the same opportunities as other Australians. 80% agree with the statement that the Federal Government should fully fund the NDIS to provide certainty to people with disability. 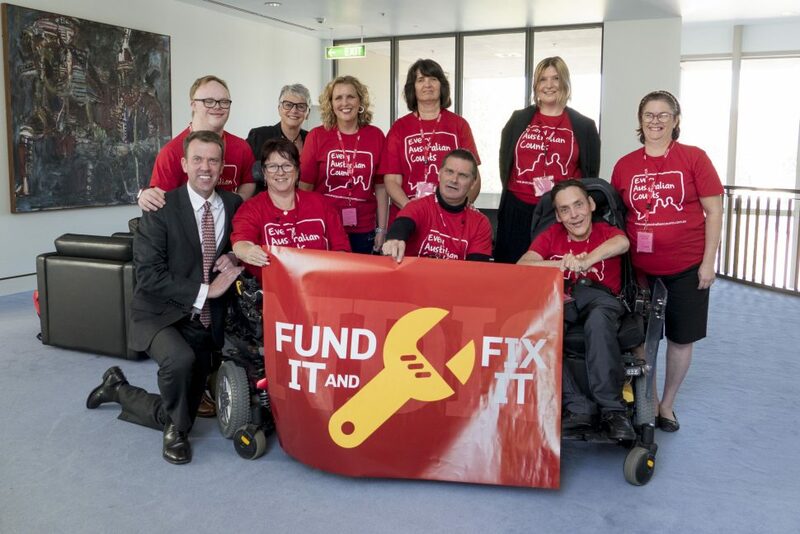 70% agree that providing full funding for the NDIS to provide the support Australians living with a disability need should be a top priority for government. These results are no surprise to Every Australian Counts. We’ve said for many years that ordinary Australians support the scheme and expect it to be funded. And now we have the research to prove it. Last week it was good to hear both sides of politics commit once again to fully funding the NDIS. It was good to hear them say they are committed to seeing it delivered in full. What we need to see in the coming days and weeks is the detail – so we can be sure the NDIS will be around for many years to come. And speaking of that – today we are also releasing the results of our survey. We recently asked you what you wanted to see fixed with the NDIS. We were overwhelmed with your responses. More than 2200 people took the time to let us know what they wanted to see changed. We have pages and pages of people telling their stories about just how badly things have gone wrong. We are still analysing all of the very detailed responses. What we are releasing today is just the summary of what we heard. Improve planning. People want to be able to see a draft of their plan to correct mistakes and catch problems early. People want more flexibility and to be able to make small changes to your plans without triggering a full review. People want better trained planners and Local Area Coordinators, and they want specialised teams of planners who understand different types of disability inside and out. No more gaps. No more gaps between plans, no more gaps in services, no more people falling between the gaps. And that includes not just people with disability but also families. No more delays. No more waiting – whether waiting on the phone, waiting to hear the outcome of decisions, waiting for vital pieces of equipment, waiting, waiting, waiting. People are just tired of waiting. Make sure the NDIS works with other systems. People want an end to the buck passing and finger pointing. They just want everyone to sit down and work out how the NDIS can work better with other systems like health, justice and education. And they want everyone to work out who pays for what. Realise the dream. People are worried that the dream of the NDIS has been lost in a bureaucratic nightmare. They are worried that the transformation we all wanted to see isn’t happening because everyone is just focused on process – and not enough attention is being paid to the change we want to see for people with disability. And while we asked people in the survey to choose the top 10 things they wanted fixed, we were struck by how many times people told us they wanted to choose everything on the list. You told us loud and clear just how frustrated you were. If you would like to read more detail, check out our four page summary. Thanks to everyone who took the time to fill out the survey and share your thoughts. We are now going to use these results to keep the pressure on our pollies to get this stuff sorted out. And we’ve got some plans for how you can use it to keep the pressure on – so stay tuned. It’s way past time to Fund it and Fix it. PS. While you are here don’t forget to sign our Fund it and Fix it petition to keep the pressure on. And please share with family and friends and get them on board too.